The country needs thousands of new construction workers each year but lack of constructions skills in the local workforce means that companies often look to ‘import’ the labour and skills they need. Our ‘Centre for Excellence’ is at the heart of our ambitious plans to significantly increase the number of young people we train. The Centre is situated on a two-hectare site next to the Great North Road on the northern edge of Lusaka. 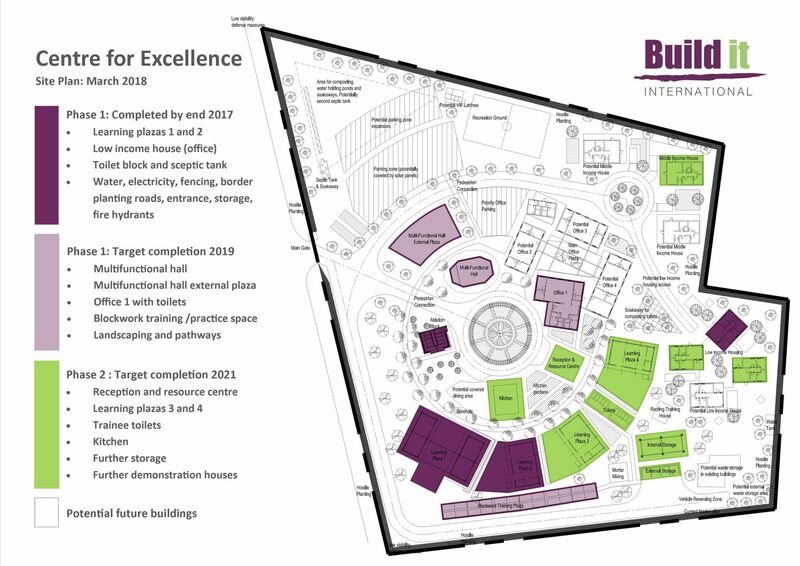 When completed the site will comprise of a series of a learning plazas, multi-function hall, practice spaces, administration and storage spaces, and demonstration houses. The site is already operational, and the rest continues to be developed in phases up to 2021. The Centre will become a hub for construction skills training, small business development and sustainable building techniques. It will allow us to substantially expand our training programme; both in terms of the numbers of trainees we can reach and the range of courses we can offer. The Centre will provide a focal point bringing together employers and graduates. It will be a hub for change.